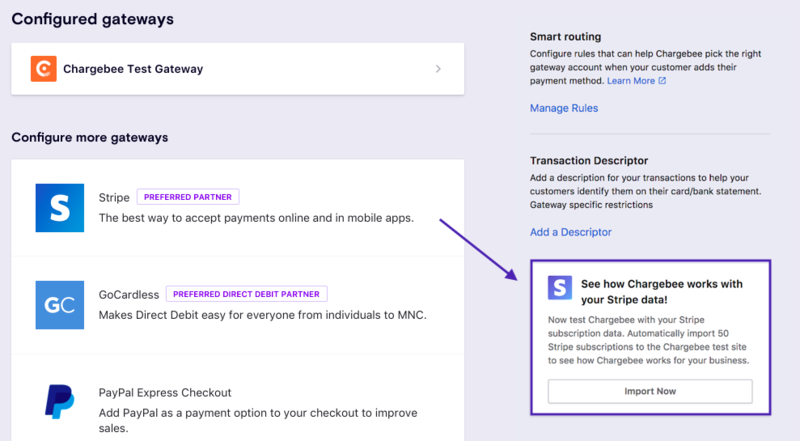 Chargebee enables you to import the latest 50 subscriptions and the corresponding plans, invoices, customers from Stripe into Chargebee to see how easily you can manage your subscriptions within Chargebee. Once imported, you can test the subscriptions in real time and see if Chargebee fits your requirements. 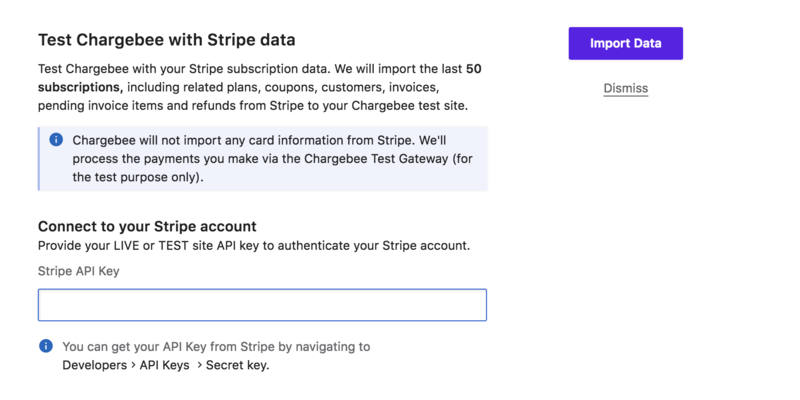 In case you decide to go with Chargebee, please do contact support@chargebee.com and we will help you in migrating your subscriptions from Stripe to Chargebee. As this is a test import functionality, it is available only for the Test Site. You can import only a maximum of 5 Invoices for a subscription. Step 2: Click the Import Now button under Stripe Subscription Test Import section. Step 3: The Stripe Subscription Test Import dialog will open as shown below. Enter your Stripe API key to authenticate your account. Step 4: Click Import Data. Step 5: The last 50 active subscriptions from Stripe will get imported automatically. You will be notified via an email once the import process is completed. Step 6: If Chargebee encounters any errors during import, it will not import them. The data (Subscriptions, Invoices etc) that is not imported will be available as a downloadable file. You can download the file by clicking the Download errors as CSV link. Step 7: In case you wish to rectify the errors and re-import them, you must make the changes in Stripe and repeat the whole process once again. This time when you re-import the data, the latest 50 subscriptions in Stripe will be imported. When you re-import the subscriptions from Stripe, the existing test site data will be deleted. If you have less than 50 active subscriptions in Stripe then all the subscriptions in Stripe will be imported. Step 8: You can view the imported subscriptions by clicking the View Subscriptions button. The following table will brief you how various scenarios in Stripe are handled in Chargebee during the test import. Positive account balance It will be imported as invoice with ‘Ad-hoc' charges for that customer. Ad-hoc charges are charges that are not associated with a plan. Negative account balance Invoiced as excess payments for the customer. Positive pending invoice items Imported as unbilled charges for the next renewing subscription. Negative pending invoice items Added as promotional credit for the customer. Positive pending invoice items Added as unbilled charges for the next renewing subscription. Multiple payment terms at subscription level for customer The highest payment term will be considered for that customer. Subscriptions with multiple plans, plans with volume pricing, group based and tiered based pricing plans. Subscriptions with metered billing plans. Will not be imported. Subscriptions with quantity based pricing plans and licensed based billing Will be imported and a quantity based plan will be created for it. Some subscription with both metered billing plans and license based plans Will not be imported. If your subscription comprises of only a license based plan, then it will be imported. Draft invoice in Stripe Will not be imported. One time invoice in Stripe Imported as invoice with "Ad-hoc" charges. Invoice is forgiven Invoice will be written off. Invoice is paid with applied balance positive/negative, total positive and invoice as auto charge/send mail Positive line items will be created as invoice line items along with discount amount and tax. Negative line items will be created as promotional credits (discount type). Account balance will be ignored. Invoice is paid with total negative applied balance positive/negative and invoice as auto charge/send mail Positive line items will be created as invoice line items and nullified with promotional credits. Invoice is unpaid with applied balance positive, total positive and invoice as auto charge/send mail Positive line items will be created as invoice line items along with discount amount and tax. Negative line items will be created as promotional credits (discount type) in the invoice. Account balance will be created as excess payments in case of auto charges. In case of send email, account balance will be created as excess payments provided the email is sent in Stripe. Invoice is unpaid with applied balance negative, total positive and invoice as auto charge/send mail Positive line items will be created as invoice line items along with discount amount and tax. Invoice is unpaid with applied balance positive, total negative and invoice as auto charge/send email Positive line items will be created as invoice line items and nullified with promotional credit. Invoice is forgiven in Stripe with total positive Positive line items will be created as invoice item. Negative line items will be imported as promo credit in invoice. The invoice will be written off in CB. Invoice is forgiven in Stripe with total negative Positive line items will be created as invoice items. Negative line items will not be imported. The invoice will be written off. Invoice is closed in Stripe with total positive Positive line items will be created as invoice item. Negative line items will be imported as discount type promo credit in invoice. Invoice will be in payment due or posted status. Account balance will be created as an excess payments in case it is negative and as a Invoice with Ad-hoc charge in case of positive balance. Invoice is closed in Stripe total negative Positive line items will be created as invoice item. Negative line items will be created as promo credit. Invoice will be in payment due or posted status based on payment due date. Coupons with max redemption The coupons will be created with maximum redemption in Chargebee. The maximum redemption being the pending redemption in Stripe. For example: If there are 5 pending redemptions in Stripe then the Max Redemption in Chargebee will be 5. The coupons that are already applied will be created (with pending duration), applied and archived in Chargebee. Customers' email will be masked in order to avoid emails being sent while testing the import. Webhooks in Chargebee will be disabled. Subscription, Invoice, Plan, Customer etc., will be created with the same ID as in Stripe. Subscriptions with multiple plans will not be imported. Subscriptions with metered billing plans will not be imported during test import. That said, Chargebee supports Metered Billing subscriptions with metered billing will be handled during Live site migration. Subscription with Volume, Tiered, Group pricing plans will not be imported while testing the import. But, volume and tiered based plans will be handled during Live site migration. Subscription with day based Plan will not be imported in Chargebee. Plans related to the imported subscriptions will only be created. Draft invoices will not be imported. Applied balance on paid invoice will not be imported as it is already used on the invoice. Paid invoices with only negative line items will not be imported. Imported invoice will not go into Dunning. If there are multiple payment terms (Net D) associated with a customer, the highest payment term (Net D) will only be considered. Payment and refund transaction details will not be imported currently. Unbilled charges at customer level will be associated with the first renewing subscription. Only card payment method will be imported rest are currently not supported. www.chargebee.com © Copyright 2018, Chargebee Inc.